I’m always on the lookout for a true hill climb car and at the top of my list was the 1968 Porsche 909 Bergspyder. In the sixties the European Hill Climb Championship meant something and Porsche was committed to winning the title although it had often done so with modified endurance racers such as the 910. Also of interest is that this is an FIA Group 7 car (just like a 7.0L CanAm McLaren), but the championship had one major limitation - a maximum engine displacement of 2L. Having heard that Ferrari were about to enter a class-specific design, Porsche decided to it had to do the same and the 909 was the result. This car’s corporate champion and Dr. Porsche’s grandson, Ferdinand Piech, felt that saving weight was the trick to offsetting the 2L limitation, and his engineers went to many extremes in order to do so. For example the car had no fuel pump. Instead a pressurized sphere-shaped tank injected fuel into the engine. This was my most challenging build as it wasn’t a complete kit. 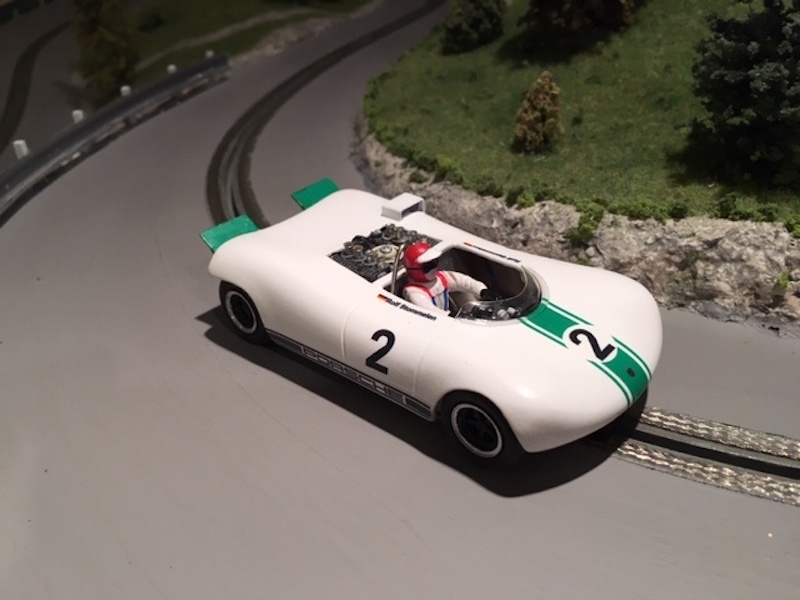 The body is from Germany, the excellent chassis from Protoslot, the decals from Milan, the tiny wheels and tires from RS Slot Racing and the cockpit from a Fly 908/3. As well I had to mould the windscreen and fabricate the dash, oil cooler, roll bar and rear wings. All very rewarding and the combination has made a great running car! Finally thanks to everyone who helped in finding the body (Tomato007), sorting out the noise and vibrations (RichD), donating the ferrules (ChrisW) and a whole lot of others for great advice. What scale? Appreciated the accompanying article. Helps to know about the lesser historical races and race cars. Thanks. 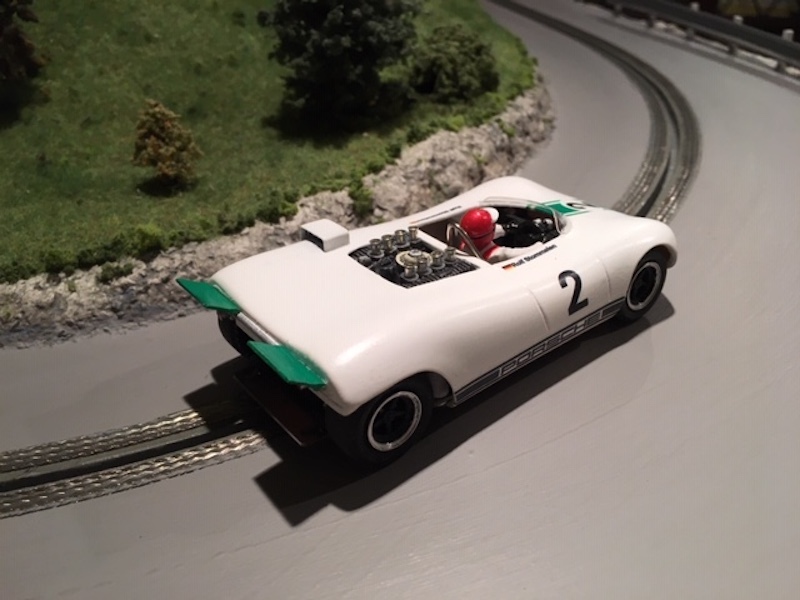 The car is 1:32 scale. The car was significant enough that it made the Porsche Museum and apparently will be run at Goodwood this year for the first time. The 909 was a defining moment for Porsche. Prior to the 909 the car bodies were crafted for style and appearance and not necessarily performance. The 904 is a perfect example. The 909 took things in a radically different direction and engineering and performance became more important than appearance. The end result of the 909 was the World Championship winning 908 and the LeMans winning 917, 936, 956, 962 etc. At 9:44 CST today I received an email from ACME Trading Company (Wil E. coyote, anyone?) featuring new Technomodels cars. Five were Porsche 909s. I had never heard of that model until then. I immediately thought of s.o.f. and his fabulous hillclimb track. Way to go. Nice model of a unique prototype.